Birthdays: Big Jim Fisk , Edmund Rostand, Lon Chaney, Sir William Harvey, Sergei Rachmaninoff, Ali McGraw, Toshiro Mifune, Debbie Reynolds, Phil Neikro, Wallace Beery, Jane Powell, Bo Schembechler, Annette O’Toole, Barry Sonnenfeld, Rachel Maddow is 43, Andreas Deja is 61. 1488- Ludovico Buonarotti, after going through a lot of trouble to get his son in the wool and draper’s guild, gives up hope that the boy would ever be anything other than an artist. He reluctantly takes him to fresco painter Domenico Ghirlandaio to be his apprentice. Michelangelo's career begins. 1747-Georg Frederich Handel premiered his oratorio Judas Maccabeus with the song "Hail, Conquering Hero!" frequently used at royal functions. 1867- Opening of the Paris World Exhibition. The first worlds fair was seen as the zenith of Napoleon III’s Second Empire. Visitors marveled to exhibits as Dr Lister’s new disinfectant, a new metal alloy called Aluminum, a new butter substitute called margarine, and in the American exhibit, a novel bit of furniture called a Rocking Chair. The Art galleries of the exhibition were filled with Ingres, Courbets and Delacroix. But nothing from Cezanne, Manet, Pizarro or any of the other weirdoes who would one day be called Impressionists. 1923- Developers S.H. Woodruff and Canadian William Whitley start advertising lots for sale in Hollywoodland, beneath their giant new Hollywoodland sign. The sign originally was covered with lightbulbs. It collapsed and was repaired in 1939, the 'land' part never restored. The Hollywood Sign was made over again in 1978. 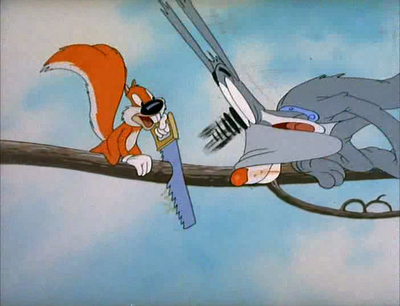 1944- Tex Avery's "Screwball Squirrel" Only a few shorts were made. As animator Bob Givens reminisced:" Eventually, everyone found that squirrel just too annoying!" 1976- Two college dropouts, Steve Wozniak and Steve Jobs started a company named Apple Computers. A third partner small businessman Ron Wayne sold his shares to Jobs & Woz before they filed papers of incorporation. He didn’t want to get stuck with the bill when they failed. He sold his third for $800. In 2011 Apple surpassed Microsoft as the worlds richest company.